This product is Part 3 of 3 and covers weeks Nine to Twelve of the course. As an optional learning aide, we’ve included a PDF document of the content in each module with every download purchased for you to print and then read at your own pace should you wish. These notes will act as a reminder of what you’ve learnt and help you digest the information more easily and deepen your home practice. We’ve also provided a Frequently Asked Questions PDF document. ‘Conscious Process’ is a wonderful resource to manage stress and the symptoms of any chronic illness. The course is extremely well structured. The course is divided into modules, each of which contain three useful explanatory PDFs and three separate mp3 tracks with reflections, meditations/relaxation sessions. Each session is fairly short but very powerful. Being short, the sessions are excellent for those of us who are unwell with pain, illness or stress and have limited concentration. I am so impressed with Linda’s understanding of our thought processes and how she gently guides us away from any negativity into a more calm and relaxed state. Even after many years of practising mindfulness and relaxation techniques, I still find immense value and enjoyment in Linda’s work. She always seems to say the right words at the right time – listening to it, it’s as though the course was written just for me. I shall continue to use the course to maintain inner calm and peace of mind and to broaden my mindfulness practice. Thank you, Linda, for producing such a valuable and accessible resource. I wholeheartedly recommend the course. Linda, your pacing is really good, and helpful for people struggling with brain fog, exhaustion and/or stress – it brings people right back down, and gives them the feeling that they can let go of everything for a while. I think you have introduced a wonderful resource to people with M.E. – I only wish I had known about it 20 years ago! This course is excellent – extremely well thought through and organised so that following it is straight forward, informative and a pleasure. In the meditations Linda’s voice is soothing, caring and articulate. The pacing has been perfect for me. I feel that each of my senses is involved with the meditations and coaching input. This means my learning is deep and meaningful and I am trusting that the tools I am gaining will help me throughout the rest of my life. This is no ordinary meditation course. It is very special. Thank you Linda. I’ve just completed your ‘Conscious Process’ course. I am healing myself from a chronic auto immune condition and I have found the course immensely useful Thank you. Your meditations have brought me back to base so many times on my journey Lindaro. M.E. is a complex, baffling illness that attacks every level of one’s being. The chronic sufferer faces institutional ignorance that often dismisses the illness as psychological, while privately-funded scientists search endlessly for a magic pill. So it is with great relief that I have stumbled upon the insightful treatment approach offered by Linda hall, a veteran holistic therapist with firsthand experience of M.E. 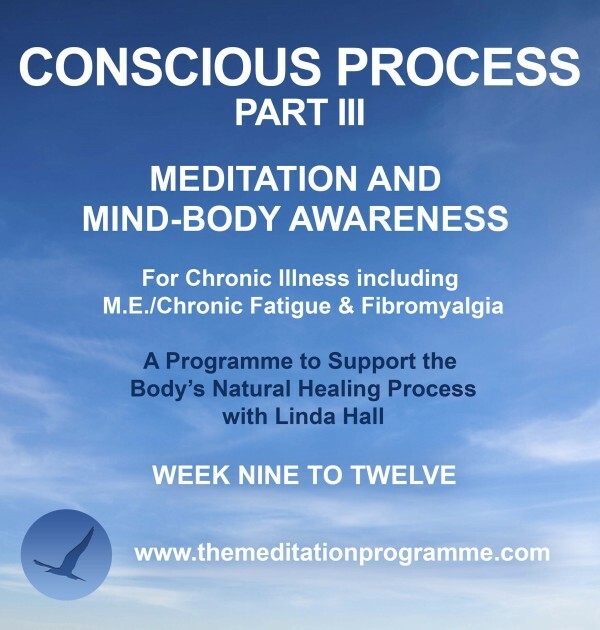 Having recovered from an eight and a half year bout with the illness, Linda developed the Conscious Process course as a structured distillation of her years of research and practice as a meditation instructor. Based on pioneering psychoneuroimmunology, the course’s 12 modules impart the basic equipment the sufferer needs to husband the beast of a wildly exhausted nervous system into a companionable cohort. Each module is organized into three parts—welcome clarity for the muddled M.E. brain!—consisting of an introduction, a meditation practice, and advice on weaving these techniques into daily life. The last part is crucial to form new habits and ways of living that root out chronic illness from the cellular level. Relaxation skills such as grounding, breathing, and letting go of self-criticism put the brakes on a vicious cycle of stressors. As Linda explains, these were set into motion when shocks such as illness, pain or insomnia generate more of the same and swamp the system with cortisol and adrenaline, stress hormones that that can throw all other hormones out of balance and impede the release of toxins. Linda tailors to the recovery process such Eastern-influenced practices as mindfulness and cultivating a wise witness, which centre our scattered thought-processes. Likewise spaciousness, positive imagery and gratitude flood the body with immune-boosting endorphins that cushion its natural ability to heal. Frankly, the soothing, authoritative quality of Linda’s voice is enough to grant a panicked system permission to relax like a cool, gentle rain that settles and extinguishes flying embers. Some of my favourite phrases: “Soften the way you are engaging with this moment,” and “Allow yourself the space you need,” have become mantras that lower the level of intensity I invest in daily activities and the accompanying self-criticism. Rather than end my short day a simmering puddle of exhaustion, I can release muscle-tension and lower heart rate just by changing my thoughts and posture in the moment. I can feel my system cooling. Inflammation is down; so are pain, fatigue and anxiety. I recover more quickly from stressors—both physical and emotional—and can think more clearly, restoring my self-confidence. 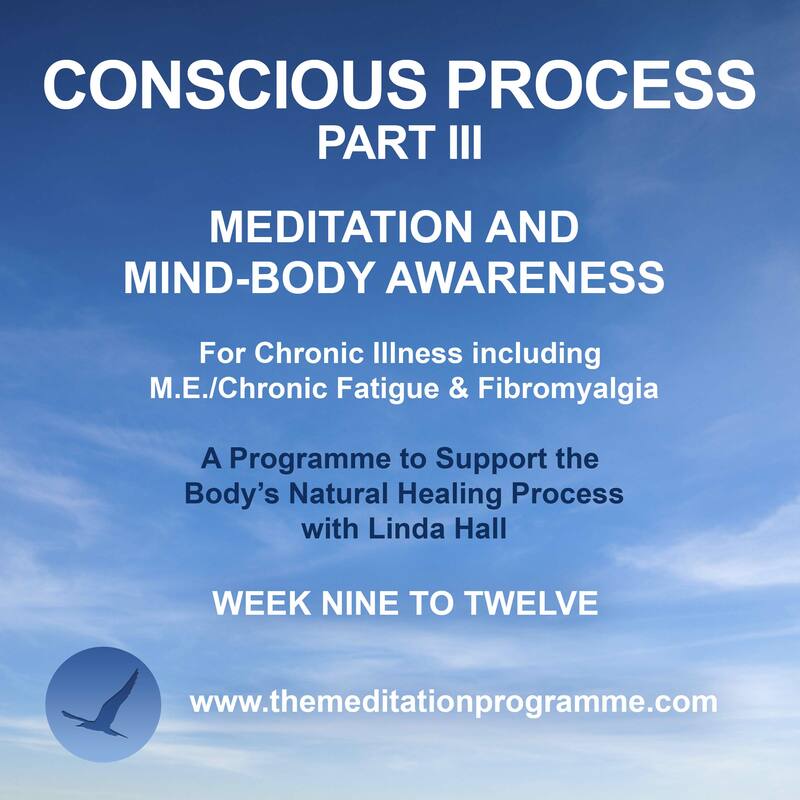 Linda has recorded numerous meditation CDs in the past, but her Conscious Process series offers the clearest, most comprehensive approach to healing. I would recommend it even for sceptics of the mind-body connection who focus on purely physical interventions. This kind of prescription requires effort and commitment but the relief can be life-changing. I have lived with M.E. for over 30 years now after a series of viral infections. The condition has progressively worsened over the years and I thought I had tried every avenue open to me so I was delighted to come across your Conscious Process programme almost by accident. I used the free trial first of all and was amazed by how much more relaxed my body felt yet at the same time energised. I find your voice very soothing and reassuring, as if you are in the room with me… I have recommended the programme on a couple of FB sites as it certainly makes me feel more in control of my condition. Thank you very much for producing it and I hope it is able to help others as it has me.